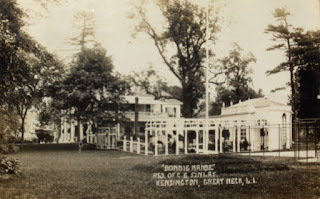 The court at 'Bonnie Manse', the Charles E. Finlay estate designed by Little & Brown in Great Neck. Finlay was one of the developers of Kensington. Click HERE for all previous posts on 'Bonnie Manse'. Postings are likely to be a bit spotty this summer... after 7.5 years I've finally run low on material and am a bit worn out...but shall persevere. Check back often. Thanks for all you have done over the years. Incredible effort and thoroughly enjoyable. Not only your efforts but also many of the other knowledgeable people that have left comments. Zach, I am so glad you are back from your vacation. We missed you. You have the greatest historic website around. I love it. Agreed - I was reminded how much I enjoy your site when, each day these last couple of weeks, I'd clicked over only to find it hadn't been updated. Time to start reposting, or engage an intern! In all seriousness, many thanks for putting together such a comprehensive collection. Thank you all. And I suppose you could say everyone out there who reads this is an intern of sorts...so if anyone has anything worth posting that we haven't seen please don't hesitate to email me. I've been sent lots in the past, much of which I have tried to post, but I have no doubt I have missed things. Going back through 2,000+ emails at this point is just too time consuming though. One thing is certain...there are 1,946 posts as of today (July 7) and I will not stop until I get to at least 2,000. Zach , your the best. I appreciate all your fine work.Thank You!!! Please keep up the good work. Your posts are most well-informed and composed, and treasured by this reader. zach is incredible. i have enjoyed and loved this site ever since i found it many years ago and the added icing on the eaves is the amount of expertise that comes out in the comments eg Half Pudding Half Sauce altho where his encyclopedic knowledge comes from i still haven't figured out. i say take a break but don't abandon the faithful altogether. we're rooting for you.